On this 100th anniversary of the end of World War I, the remembrance of my family link to the war takes me back in time. My Grandma Lilly’s brother, Helmer Hovick, a true Norwegian bachelor farmer who lived in the Dakotas in the years before the war, was a World War I doughboy. He served as a courier. When he returned from France, he herded sheep for a living, and in his last years, he resided in Miles City, Mont. In 1960, he traveled to Europe with his sister and nephew, to Norway. On this trip, they also visited Verdun, France, where he had served. My aunt tells that Helmer never spoke of the war. I wish I could say I remember him, but I really don’t. I was young and not paying attention. But I do remember the World War I veterans in the color guard at parades in Rhame, N.D., all those years ago. Men who returned home and quietly went about their lives with dignity and honor. I remember attending Veterans Day programs my father organized at the Mound Church in Slope County, where I recited to the crowd “In Flanders Field,” with my poppy pinned to my clothing, my legs shaking ever so. 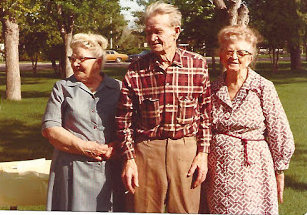 Helmer with two of his sisters, Anna and Emma. Anna’s husband, Gaylord, was gassed on the front. Tomorrow (this past Sunday), when the bells ring throughout my town, I will honor my great-uncle and all of the other soldiers, including my father, husband, and brothers. by Wilfred Owen, a British soldier who died in World War I on Nov. 4, 1918, just a week before the Armistice was signed.